In stock now! Available immediately. available for Windows95 and later Windows platforms. 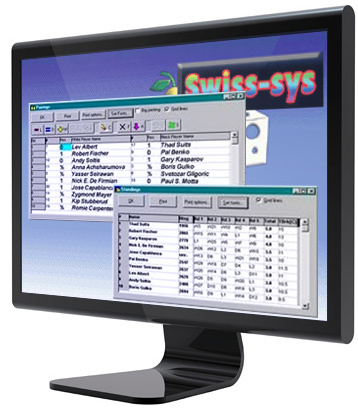 SwissSys is hailed as "the most popular, powerful, yet easy-to-use chess tournament pairing software in the world"! 1) Who would want to use SwissSys? Almost anyone who directs chess tournaments. No size is too small, and sections up to 1000 players are child's play to pair. Regular Swiss tournaments, team and scholastic tournaments, round robins, and even double-blitz tournaments are all easy to manage. It makes pairings for Swiss system (and round robin) tournaments, following all USCF (or FIDE) rules for alternation of color, transposition of players--the whole business. It lets you print out pairings, standings, wall charts, upset results, new ratings, expired memberships (so you'll know if you have any players who need to renew) and lots more. In fact, there isn't much it can't do for you except make the coffee. It can import player registration information from the USCF supplement with just a few keystrokes. It is extremely flexible and customizeable, making it the ideal assistant TD for all levels of competition. 3) Where has it been used? The U.S. Open, the National Open, the World Open, the Mexican Open, and thousands of club and regional tournaments from Queens, New York, to Queensland, Australia. 4) Can it save money as well as time and aggravation? Yes, it can! Using SwissSys you can generate ratings report files which can be sent to the USCF via the Internet where a tournament can be rated within an hour, and it saves you $$s on your ratings fees, as well. For any tournament director it's actually a "No Brainer" because it doesn't take many tournaments for SwissSys to pay for itself with these features! Import and export players using Excel and Access files (pre-2007 format) as well as dBase. Easier, more automatic setup of databases. SwissSys data now saves to Excel spreadsheets. Saving to the older format is also still an option. Quick access to all players from all sections using the roster. View combined sections in the charts. Pack and unpack a tournament for easy sharing and archiving of all section data. Ladder tournament support. All the standard variations are covered. Random pairings within a score group, Experiment with these (advocated by some well-respected players and TD's) as a way to add spice to your tournaments. Double round robins with non-consecutive games are now supported. Pair up to 24 rounds, and round robins of up to 20 players. Better pairings in some tough-to-pair conditions. Send E-mails to all your players, with optional attachments of SwissSys charts in html format. FIDE ratings report, along with more thorough norm reports and certificates. Print student certificates and awards. "Scratch pad" feature for keeping notes to yourself about the tournament. View any round's pairings, not just the current round. Specify double blitz results on a round-by-round basis. Automatic registration in the proper section based on ratings or age/grade. Move a whole team to a different section at once. Merge multiple files at once in an easy-to-use dialog.